So what is my connection to Six Flags? Why do I love the place so much and can’t get enough of shooting it? I just can’t quite explain it. There’s something about the way it has a Walking Dead look, mixed with remnants of happiness that just gets to me. 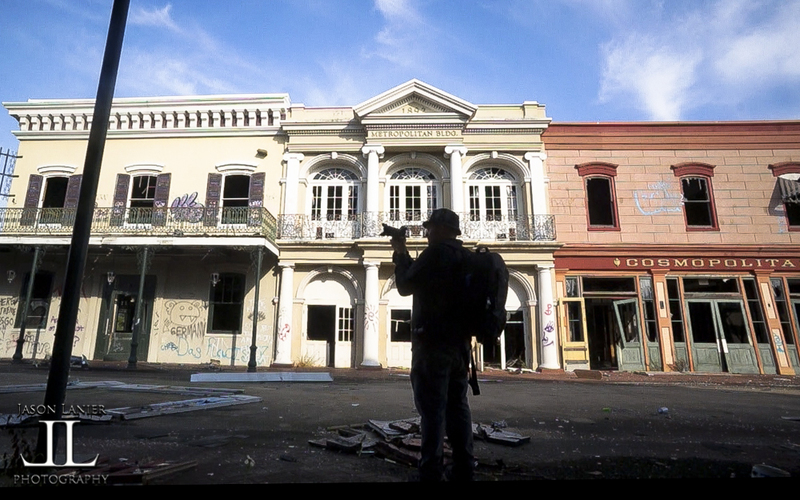 I love Urban Exploring and have done it all over the world, but there isn’t a place that draws me quite like Six Flags New Orleans. Now let me get a few housekeeping things out of the way. I have no official affiliation with the City of New Orleans or with Six Flags. I DO NOT recommend going into Six Flags New Orleans. Have lots of questions regarding the park, risks of going, what’s going on now? This isn’t a matter of do as I say but not as I do. This is a matter of timing. Things have changed since I went into the park. In February 2015 I drove past the park (I did NOT go in) just to see how it was doing since I was there (quite some time) and it’s completely locked up. They have barricaded the service entrance that was wide open when I went there for my Busted at Six Flags video and have put up brand new fencing blocking the main entrance as well. Simply put there just isn’t an easy way to get into the park any longer. This is the way the entrance looked when I went into the park. It was WIDE OPEN. This is how it looked through my dashboard cam the last time I went by there. 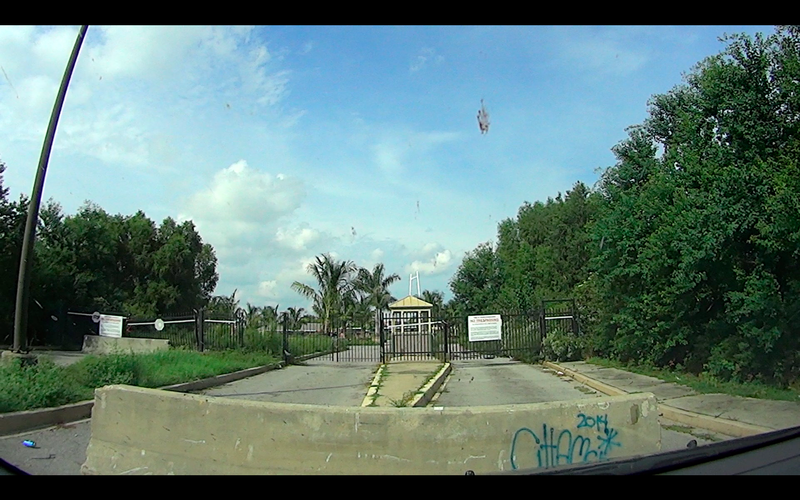 All closed up with concrete barriers and “No Trespassing” signs. I’ve been told by people that live near the park that it is currently (April 2015) being used by a movie studio and that they are building a big set on the parking lot space. If that’s the case it sounds like the park will be occupied for quite awhile by the Hollywood Rich guys. So I heard about this place years ago while I was shooting in Pensacola, FL. I googled it, and I immediately added it to my Bucket List of places I needed to shoot. So a few years ago I had the opportunity to visit New Orleans. I googled the location on my GPS and it took me right to the park. I was surprised to see that all the gates were WIDE OPEN. It was surreal. I’d wanted to shoot at this place for years, and here was my chance. So I lingered by the gate for awhile waiting to see if there were any security guards, etc. There were none. I then determined as hard as it was, I wasn’t going to go in that day. I was instead going to come back the following day better prepared for the shoot, and if it was still wide open I’d go in. After all, the last thing I wanted to do was enter a wide open gate only to be met by security. So I came back the next day and sure enough, the gate was still wide open. I just couldn’t believe it. There weren’t any No Trespassing signs, and I knew it was no longer privately owned. So I cautiously went into the park, half expecting to be met by a park authority. There just weren’t any. There were some other people in there, and even some vandals that I threatened to report to the cops if they didn’t stop destroying the place. They left. 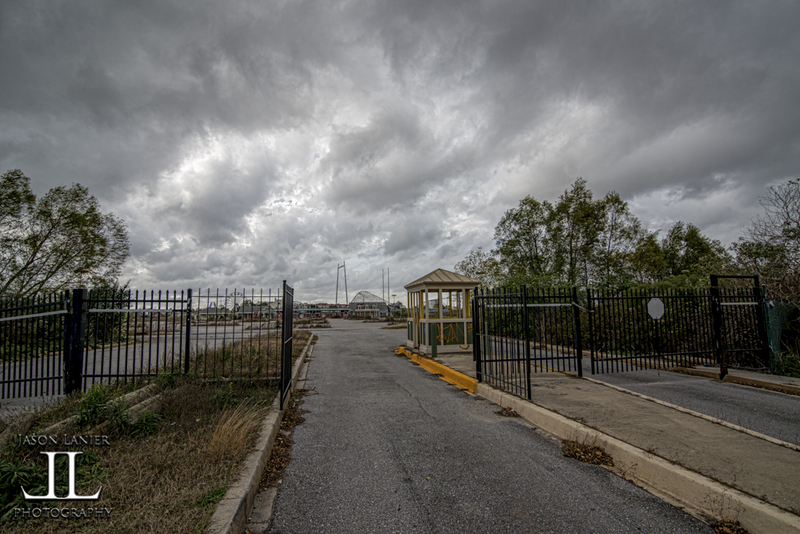 Here’s hoping that the park will eventually be given to a responsible company to renovate…and if they do, I truly hope I can be there to help document and chronicle the process….